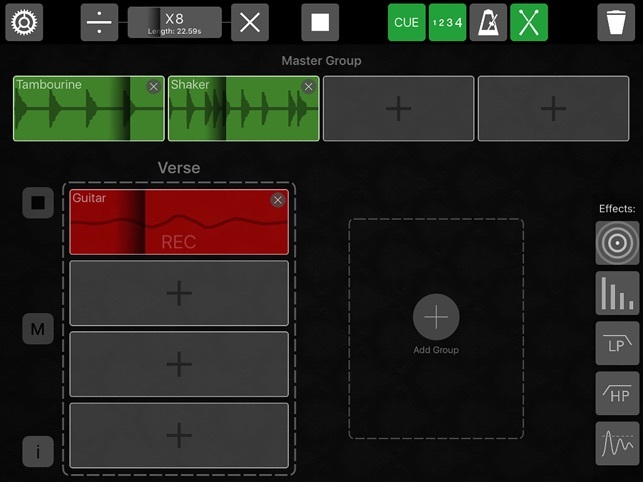 • Intelligent audio looping for the iPad. 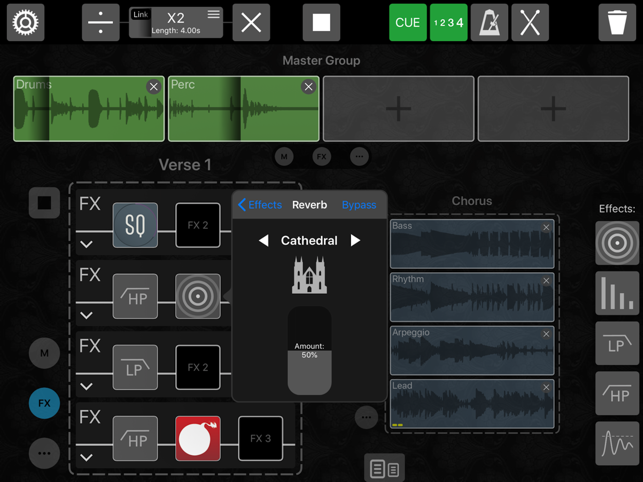 • Record, loop, overdub, add effects and much more! The perfect music creation tool for performers, song writers and beat boxers. 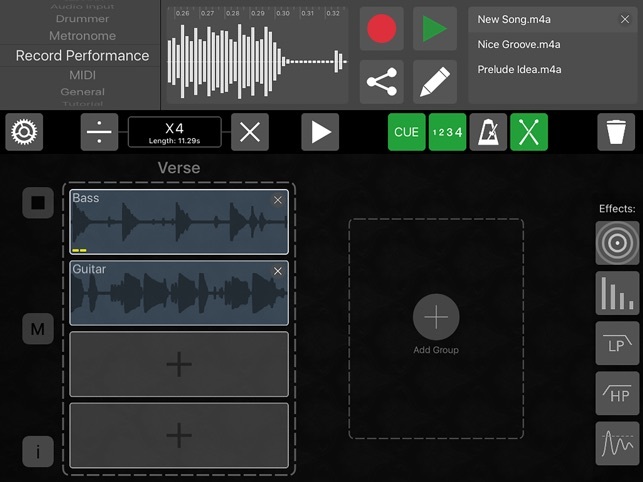 • Create entire songs with verse, bridge and chorus structures then switch between them in real time. • Audio Unit v3 effect support - Use your favourite 3rd party effects. • Built in drum machine. •	Record and loop your voice or instrument. •	Group together loops to create sections (e.g. Verse, Bridge, Chorus). •	Switch between groups in real time. •	Audio unit version 3 support. •	Ableton Link support - Play in time with other music apps and devices. •	AudioShare support - Import and export loops via AudioShare. •	Inbuilt effects - Reverb, delay, noise gate, LP/HP filters. •	MIDI control - Control Group the Loop remotely with a MIDI foot pedal or any supported device. •	Built in drum machine - Jam along to a comprehensive collection of grooves and beats. •	Drag and drop support - Drag and drop audio files between Group the Loop and other apps. •	Pitch algorithm - Change the tempo by altering the pitch. •	Time stretch algorithm- Change the tempo without altering the pitch. •	Overdub - Record infinite layers on any loop. •	Undo / redo overdub layers. •	Volume and pan - Adjustable on every loop and group. •	Labels - Label loops and groups. •	Headphone monitoring - Monitor your instrument through your headphones. 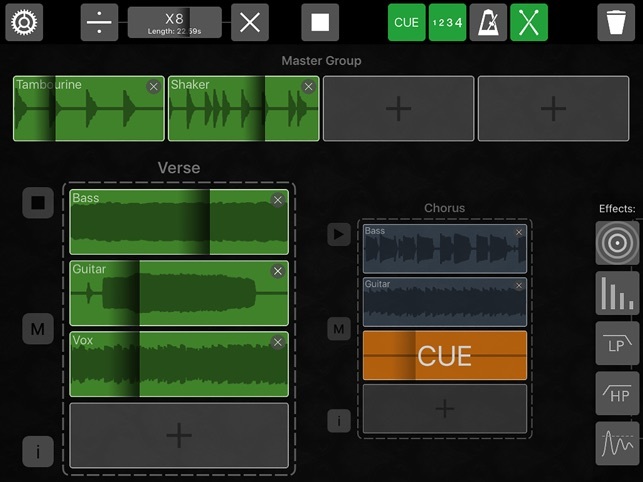 •	CUE recording - Automatically start and stop recording loops. Or turn ‘CUE’ off for instant and continuous recording. •	CUE muting - Loops will wait until the beginning of the next cycle before muting/unmuting. •	CUE overdubbing - Loops will wait until the beginning of the next cycle before overdubbing. •	Performance Recording - Record your performances in real time. •	Count In - Counts you in before recording a loop. 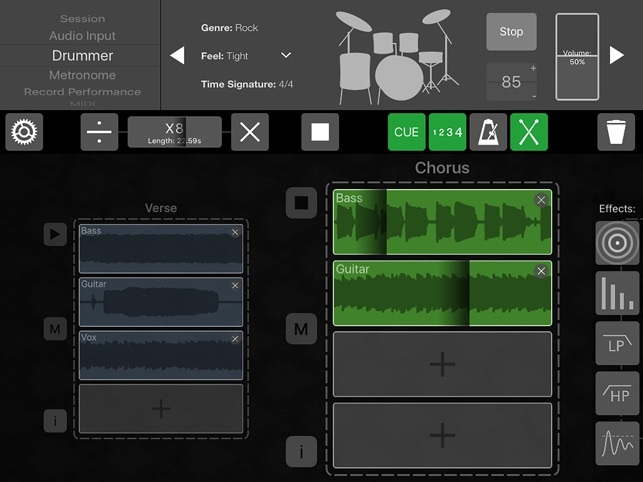 •	Master Group - A separate group for drums or percussion that plays throughout your song. •	Move - Move loops between groups. •	Merge - Combine two loops. •	Copy - Duplicate a loop. •	Sample accurate recording and playback - Keeps your loops in perfect sync. •	External audio interface support - Use an audio interface to connect to a PA or amplifier. •	Supported buffer sizes: 64, 128, 256, 512, 1024 frames. •	Supported sample rates: 44.1kHz, 48kHz. GTL is amazing for crafting songs, working out ideas, improvisation and more! I've tried more than a few looping apps and I find GTL to be the easiest and most intuitive to use. The quality of the recording comes out really well and I LOVE that the app is always being updated, the forum is informative and the developer amazingly helpful and responsive. A must have in your music making arsenal! Pretty much every feature I need for live, performance looping. Just need an iPhone version! Ultra-smart and fluid composition software, nothing out there like it.